How come after a couple days of making a YouTube video about Is Thrash Metal Day, located at THIS LOCATION, I find a new Thrash Metal band that I enjoy. I guess that is just the way the world works. Going to say that if you like TESTAMENT then you will enjoy this album. Album starts with the song Infoctrinate. I think this is a great album open. It is a every Thrash Metal song. But my only problem with this song is that it is almost seven minutes long. I feel that last minute of so could have been trimmed down. The Citizen Patrol (song two) has a really go solo to it. The third song The Devil's Tower is a good song, it just feels long. And it is long coming at six and a half minutes. I want to stop a say that I do not have a problem with long songs. I have a problem when the song just feels long. The Witching Ground (song four) and Under the Knife (song seven) are tied for my favorite songs off the album. The two songs in the middle of these songs are Hara Shiva (song five) and Abhor Sadhus (song six). Hara Shiva feeling like a filler song but it is actually catchy. Even though it is filler if I listen to this album again I differently wont skip it. Abhor Sadhus the only note that I have for this song is I could really hear the TESTAMENT vocals on this one. Not saying that is a bad thing. I love the vocals on this album. Overall I enjoy listening to this album. It has some week stops for me, like songs feeling too long. But it is worth a listen to if you enjoy Thrash Metal and/or TESTAMENT. Rating: Stream it to see if you like, then buy. 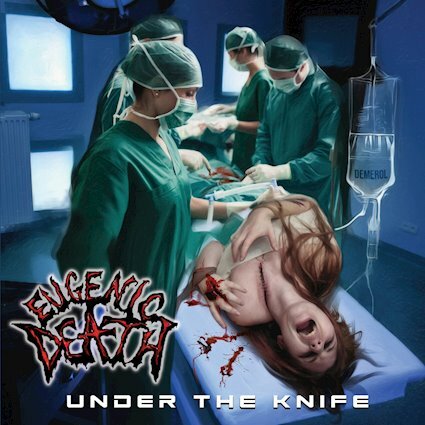 In 2012, Eugenic Death's debut album Crimes Against Humanity was released by Heaven and Hell Records. A year later Ian Pasquini parted ways with the band due to personal reasons. The following year Shane Lucas also parted ways with the band. In 2014 the recording process for Eugenic Death's second album Under The Knife began. Geoff Lapenta was recruited to perform drums on the album. Jonathan McCanless on guitars and bass, and Keith Davis once again on vocals.